Watch Peddarikam Movie. 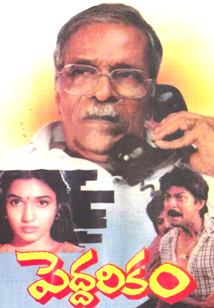 Peddarikam is a 1992 Telugu film directed and produced by A. M. Rathnam under Sri Surya Movies. The rivalry between two families of Adusumilli Basavapunnamma (Bhanumathi) and Parvataneni Parasu Ramayya (N. N. Pillai) leads to fake love between Parvataneni Parasu Ramayya's youngest son Krishna Mohan (Jagapathi Babu) and Basavapunnamma's granddaughter Janaki (Sukanya). They really fall in love and then the trouble starts between the families. How they win their love forms the rest of the story.